Early stage startups in the CEE looking for investments, mentoring opportunities and networking can now be a part of this year’s How to Web Startup Spotlight – competition and orientation program with $20.000 cash prizes for the best 32 teams in the region. Aimed at those startups who’ve been running under two years and have received less than 100.000 euro in funding, Startup Spotlight is an intensive program for CEE startups that are working on tech products. The program will take place from November the 19th through 22nd in Bucharest where teams will face workshops and dedicated mentoring sessions, top notch investors and early stage investments funds as well as their representatives. 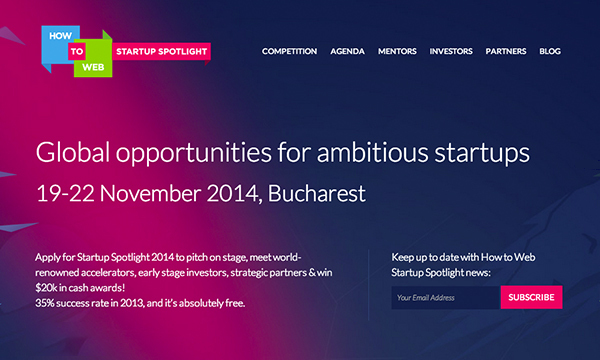 TechStars, 500 Startups, Seedcamp, and 3TS Capital are just some of the names who will be in Bucharest. Latest stats show that year over year, 35% of the startups that attended Startup Spotlight managed to close important deals as a result of participating in this program. Numerous mentors gave valuable information and feedback to all the teams who later found it much useful during their startup voyage. Startup Spotlight is currently looking for startups that have been working on their product for less than two years, have developed a prototype and haven’t received more than 100.000 euro in funding. Also, one of the co-founders has to be from the CEE and at least part of the team should currently reside in the region. If you’re interested in finding out more about How to Web Startup Spotlight, you can visit their official website where you can also apply for the program until Monday, October the 20th. Startups that do make it into the program will be notified by October the 28th. Good luck!